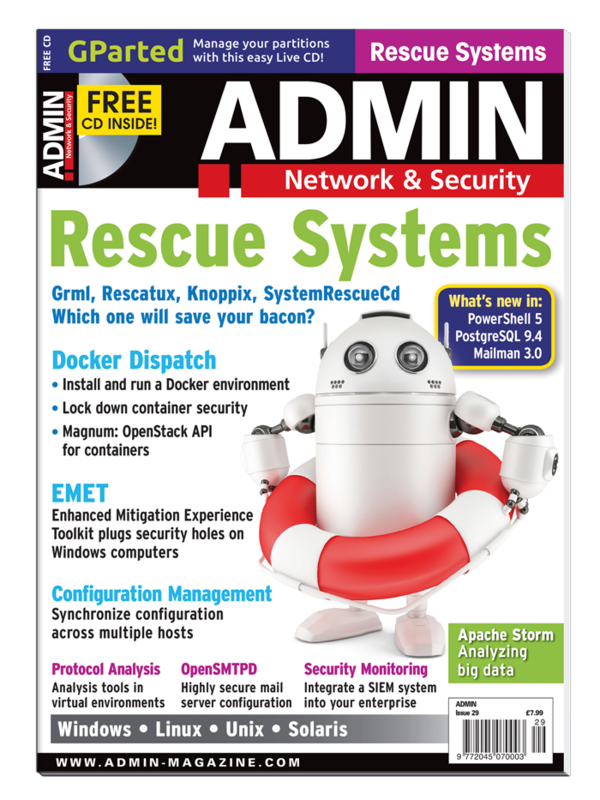 Issue #29: Rescue Systems – Grml, Rescatux, Knoppix, SystemRescueCd Which one will save your bacon? On the DVD: GParted - Manage your partitions with this easy Live CD! Separating Docker containers from the hypervisor in the OpenStack cloud. Grml, Rescatux, Knoppix, and SystemRescueCd show how they can help when your systems are in trouble. An updated release that simplifies the task of managing modules and software packages. Analyzing large volumes of data. We talk with Nithya Ruff, Director of the Open Source Strategy Office at SanDisk, about their effort to adopt open source across all business units. Microsoft closes vulnerabilities on Windows computers using the Enhanced Mitigation Experience Toolkit. Oracle offers several approaches to creating a high-availability environment. The new major release of this popular, free database includes a range of changes regarding speed and functionality, as well as innovative functions. We put the latest version of the Free GNU mailing list manager through its paces. Install, configure, and run a Docker environment for scalability, high availability, consolidation, multitenancy, and portability. Access a Windows application as a cloud service with Microsoft Azure RemoteApp. Choosing a Security Information and Event Management system and implementing it for the enterprise. This customized version of PowerShell is pre-loaded with extensions for the mail server. Etcd, ZooKeeper, Consul: Three tools to help you sync configurations across multiple hosts for scale-out setups. Understand the I/ O pattern of your parallel application to improve its performance. Developers are improving Docker security now and for the future. Monitor and analyze network functions, even in virtual environments. The OpenBSD origins of the OpenSMTPD mail transfer agent makes SMTP more secure and easier to implement.